Airlines are the backbone of the Rotate Community for pilots. We want to facilitate them with a support system which will be deeply integrated into the Rotate Network’s structure. For the first time all major aspects of real-world airlines will be present and integrated into a flight-sim network. 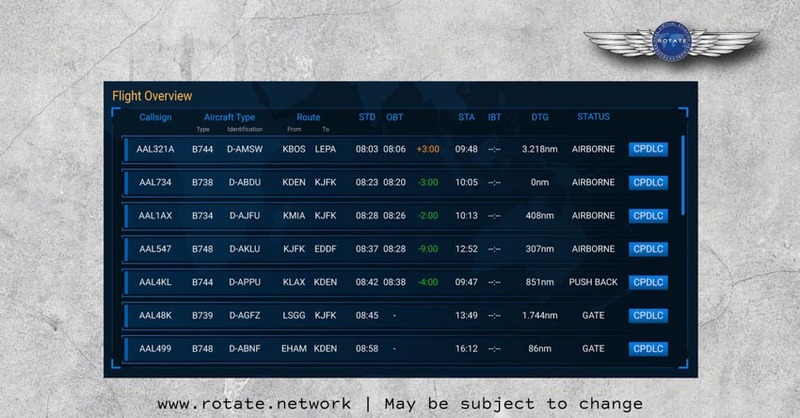 The Airline Dashboard gives Airline managers a detailed overview of all flights and helps them communicate to active airline pilots via the network-wide CPDLC integration. Similar to the Live Map you can track every plane in your airline, and get advanced statistics and time calculations, so you always stay up-to-date. We will give you a multitude of tools to choose from and you can decide which ones you want to use. Almost all features such as the participation in the global economy, realistic aircraft turn-arounds and flight plan management are optional. 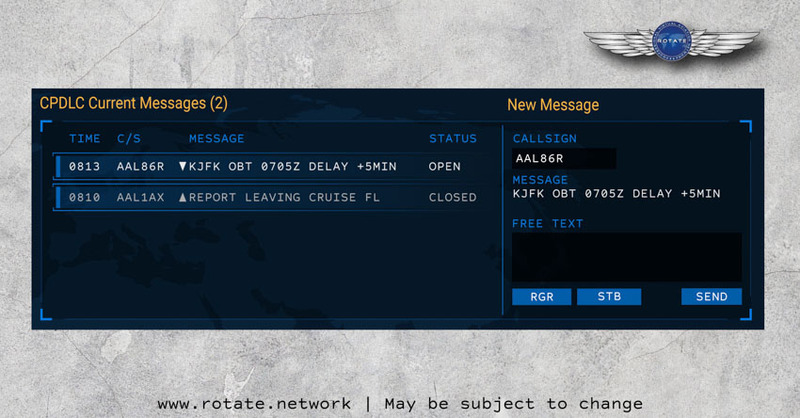 If you want, you can simply get your unique callsign and fly. Getting a detailed overview of all your airline’s flights is essential if you want to compete in a global economy and rank yourself against other airlines. The live map gets regular updates from the system and checks if the flight is still in the timeframe or deviating from its planned course. That way you will know immediately when problems such as delays occur. Flight plans are essential for a smooth operation. Airline managers can easily file and validate one-time or recurring flight plans in the airline dashboard. Other pilots from your airline will then be able to use them for their flights. You can manage your planes by making them unique. Just as in real life you would have to fly from your last location, pilots will have to fly from the last known location of a plane. Unique aircraft will add yet another layer of realism to the overall management of your airline. 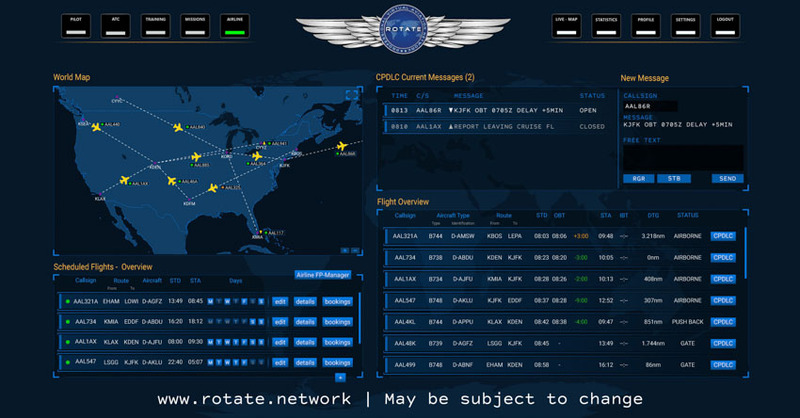 This is just a first look into our extensive airline system, over the coming weeks we will release more information about the airline economy and give you a chance to register your airline in the Rotate Network. Do i understand right, that Aircraft location and unique aircrafts will be an optional option for an airline? You decide yourself how you want to use the airline functions. All tools are available to everyone and you can simply activate or deactivate the ones you like. Seems pretty revolutionary to me..no other Network handles VAs in such a fashion! Thumbs Up! but is registration for Virtual Airways already active ? Will it be possible to integrate traffic with the website ? Hey Giovanni, welcome to Rotate! Can you tell me what exactly you mean by integrating traffic into the website?